Roerich is a Russian artist, publicist, an extremely versatile person who gave the world a huge number of paintings. He was distinguished by indefatigable energy, the desire to try everything that life could offer him, as well as intolerance to evil in all its manifestations. “Armageddon” is one of his paintings, deeply symbolic and reflecting the artist’s attitude to what was happening in the world. It was written in the year when the civil war in Spain began, and all of it seems to be enveloped in flames. 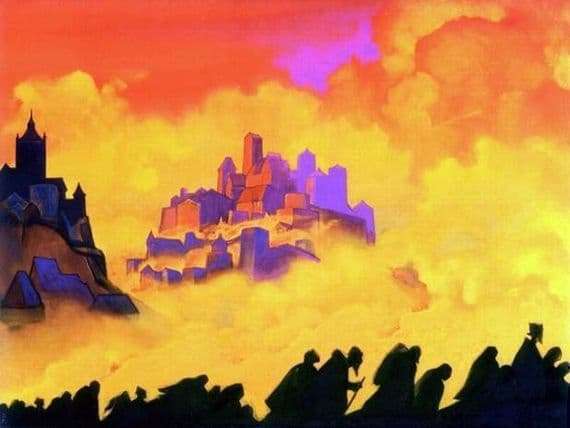 A great city is burning on the mountain, the flames are licking its houses and streets, everything is on fire, covered with purple and gold, and below, at the foot of the mountain, people – men and women, children and old people – leave. As if by a terrible prediction, they were laid on a yellow background of a flame with two-dimensional silhouettes – as if traces were left on the walls of Hiroshima and Nagasaki after atomic explosions, and their heads were lowered to the ground. Only a few lift their heads to the city devoured by fire and the sky on fire – their faces are lit with reflections and full of fright, visible even in such a wrong light. But the world is not going to change at all, despite all the warnings.